Embattled Facebook has hired Nick Clegg, a former UK deputy prime minister, to head its global affairs operation. The 51-year-old ex-leader of Britain's Liberal Democrat party will succeed Elliot Schrage. Clegg, who lost his seat in parliament in 2017, will move to Facebook's Silicon Valley headquarters next year. He'll join Facebook in London during the next few weeks. A one-time European Commission trade negotiator, Clegg has close ties with officials in Brussels, where Facebook faces regulatory challenges on the data protection front. 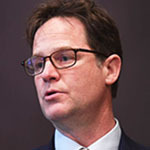 The Financial Times reported that Facebook CEO Mark Zuckerberg personally recruited Clegg for the PA position with the promise that he will play a major role in shaping policy.